I’m a neat freak. My office desk not so much, but everything else about me is spotless and germless. Also, I’m a bit of a FDA whore. I like how the food we get in the US, for the most part, has come from clean manufacturing plants. So when I get candy from some country not called “The United States”, I bristle a bit. 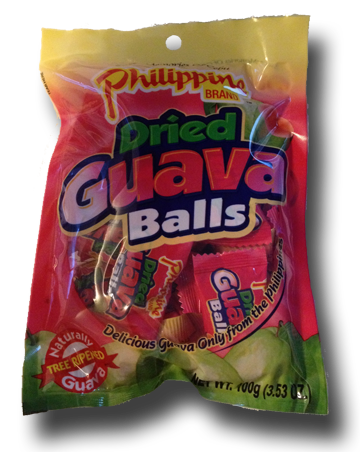 Is anyone overseeing the making of these Philippine brand Dried Guava Balls? It sure don’t look like it. After unwrapping these from their individual packages (which both infuriates me — really? more plastic? 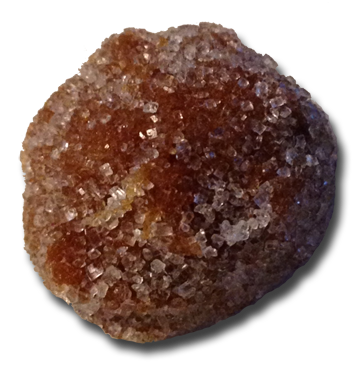 — and pleases me — ok maybe these are made in a legit factory), I see what looks like a nub of dried fruit, rolled in grubby hands to make a maltball-sized dirt nugget, dipped in sugar crystals. Appetizing? Not really. I could barely put it in my mouth. After convincing myself I wouldn’t get sick, I bit down on the brown, semi-soft and gritty sweet thing and I was surprised. Not because they were good – because they’re not. But the flavor immediately took me back to my younger years when I drank Kern’s Guava Nectar. Unfortunately these fall short of the drink in oh so many ways. For one, they aren’t refreshing. Two, they aren’t that sweet. Not a deal-beaker for me but it’s not so much ‘candy’ as it is a marzipan-like grit nugget. These remind me of the Mexican Borrachines, which I didn’t like either. The Borrchines are worse though, they are way softer and too sweet. These Guava Balls at least have some density and not too sickly sweet. And hey — three cheers for the guavaness! It’s there, and it’s real tasting. 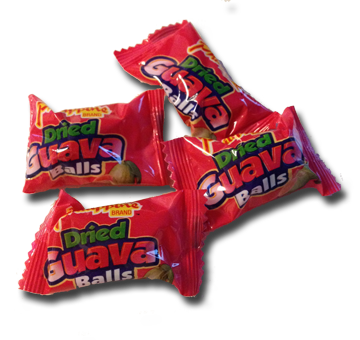 But true flavors notwithstanding, the weird brown color and sand residue just don’t help the Guava Balls cause. 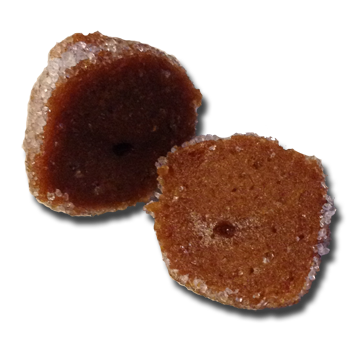 Do yourself a favor and take a pass when you see these in the candy bowl. Unless you want to eat one just so you can knowingly nod at my Kern’s comparison. The same company actually makes some very tasty dried mango balls, as they make some of the best dried mango pieces too. As far as dried mangoes go, Phillipines is one of the best brands – and they sell big bags of them at Costco. I’m still laughing at the title of the post. These balls sound all wrong. Darn it! Wish I had read this review before I tried it. They sound good especially since I like guava. The taste was just a bit off and I didn’t care for the texture. I have tried that brand’s dried mango pieces and it is always been good.